CAMBRIDGE, MA – March 10, 2014 – Today, PatientsLikeMe kicks off a new campaign promoting the value of sharing health information to advance research. In a series of public service announcement-style videos, the company highlights a movement called “data for good,” which underscores the power of donating health data to improve one’s own condition, help others and change medicine. “This year marks the 10-year anniversary of when our co-founders first introduced the idea that openness in healthcare is a good thing, and should be encouraged and celebrated,” says Michael Evers, Executive Vice President of Marketing and Patient Advocacy at PatientsLikeMe. “The ‘data for good’ campaign is our way of tipping our hats to the massive amounts of data that our members have shared to date. It’s also meant to inspire more people to contribute their experiences to accelerate research. In the video series, PatientsLikeMe co-founder Jamie Heywood walks people through the journey of being diagnosed with a life-changing condition and frames the underlying problem in creating a patient-centric healthcare system. He then asks everyone to participate in a movement around health data donation – “join us in this amazing journey to make your data, your experience drive medicine”. This campaign launches on the heels of a recent paper published by the Institute of Medicine (IOM) highlighting a PatientsLikeMe survey focused on people’s willingness to share health information to change medicine. According to survey results published in the paper, 94% of U.S. adult social media users with a medical condition agree with sharing their health data to help patients like them and should be used to improve the care of future patients. “Sharing helps me track important health information and improve research about this disease. If I am willing to be transparent, hopefully others will be inspired to do the same,” says Starla Espinoza, a member of PatientsLikeMe since 2008, joining just months after her multiple sclerosis diagnosis. Starla represents one of more than 250,000 members who are donating their disease data to research on PatientsLikeMe. To date, the community has contributed more than 21 million structured data points about their disease experiences including treatment and symptom reports, demographic information, health outcome surveys, lab data and more. In a recent study focused on sleep issues, PatientsLikeMe was able to pull more than 5-years worth of data to analyze from its platform – including over 184,000 symptom reports previously shared by 65,000 chronically ill patients. The company then ran an additional survey to collect more data and received 5,000+ responses in less than two weeks. 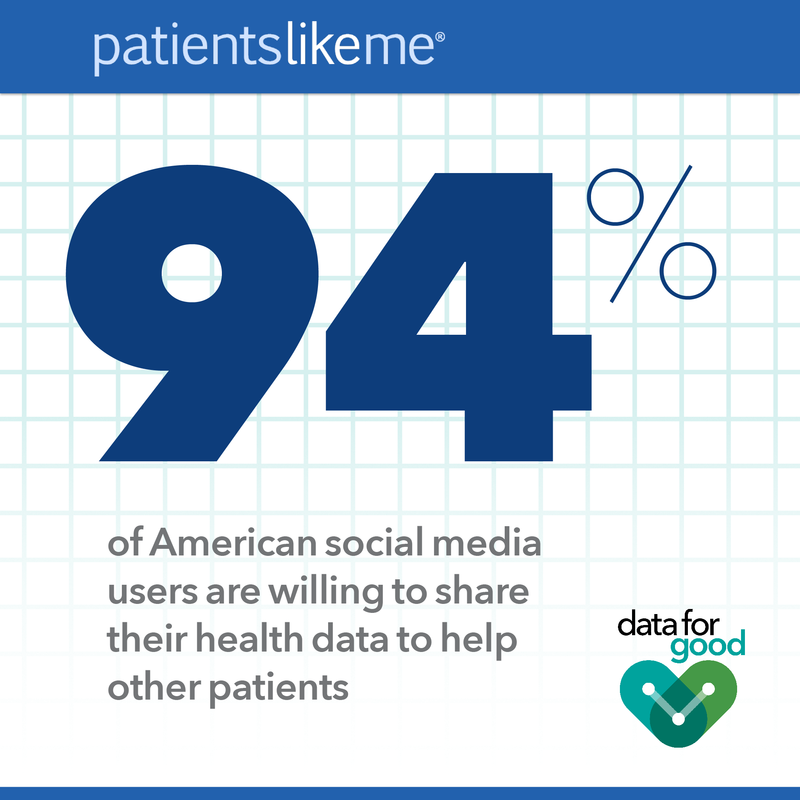 PatientsLikeMe’s “data for good” campaign will blanket all of its social media channels and invite people to join the movement (#dataforgood). “Your data has a heartbeat that gives new life to medical research and a better future to someone like you,” says Heywood. Anyone can join PatientsLikeMe and share their experiences to help others while helping themselves. To learn more, go to www.patientslikeme.com/dataforgood.